Sufganiyot, round, jelly-filled doughnuts, are a popular Hanukkah treat. I finally got around to making these towards the end of the holiday, but they are so delicious that I plan to make them all year round. I lightly adapted a recipe from the New York Times, swapping orange zest for a pinch of cardamom, a flavor I fell in love with after eating baked goods from two different corners of the globe: a Persian friend’s cardamom cookies, and a brioche-like cardamom bread I bought at a Swedish bakery. 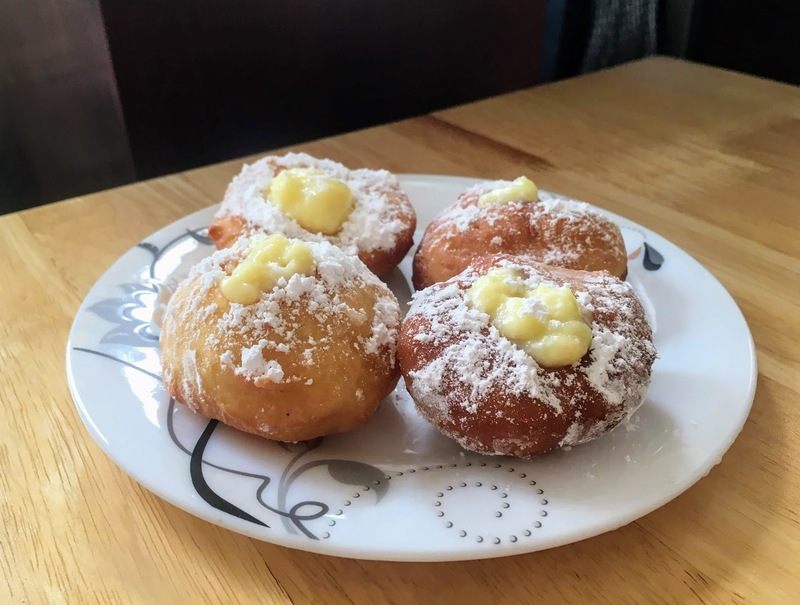 I fried the doughnuts in walnut oil, and filled them with vanilla and cardamom pastry cream, adapted from a recipe by The Incredible Egg, rather than the usual jelly. 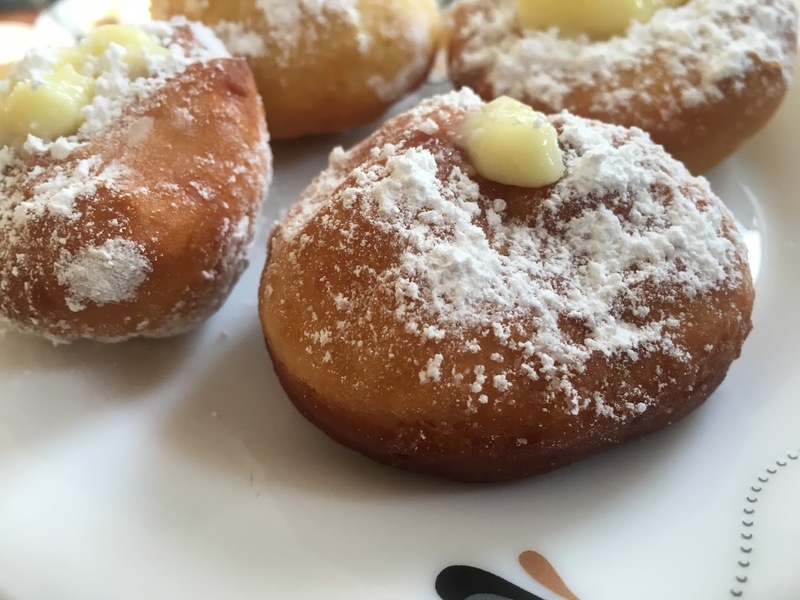 The cardamom in this recipe is very subtle, so if you are a huge fan of the flavor, increase the amount in the dough and the filling by a little bit, or sprinkle some on top after the doughnuts have fried. The dough itself is not that sweet, so feel free to dust generously with powdered sugar. Prepare the dough: Place milk in a small bowl, and microwave until lukewarm. Sprinkle yeast and 1 teaspoon sugar on top. Set aside until foamy and bubbly. In a large bowl, either by hand or with a mixer, whisk together egg, egg yolk, and remaining sugar until smooth and light. Stir in sour cream, salt, vanilla, cardamom, and yeast mixture. Add flour, and mix for 3-5 minutes until smooth and elastic, adding a tiny bit more flour if necessary (the New York Times recipe recommends not adding more than 3 tablespoons.) The dough will remain a bit sticky. Place in oiled bowl and cover with plastic wrap. Refrigerate a minimum of 4 hours, preferably overnight. Prepare the filling: Place egg yolks in a medium bowl. Add milk and whisk until smooth. In a medium-size saucepan, combine sugar, corn starch, and salt. Slowly add milk mixture, stirring with a whisk as you pour to prevent cornstarch from clumping. Cook over medium heat, stirring frequently (I practically stirred my pastry cream nonstop,) for around 18-25 minutes, until mixture thickens and begins to boil. Once mixture is boiling, whisk for another minute, then remove from heat. Stir vigorously to cool the mixture down, then spread onto a jelly roll pan or other large, rectangular baking pan (I find this helps the pastry cream cool down faster.) Immediately cover with plastic wrap to prevent a skin from forming on the surface. Refrigerate until fully cool. Fry and assemble: Remove dough from fridge. Roll or press dough onto a flour surface until 1/2 inch thick. Cut into rounds using 2-inch cookie cutter, and place on a parchment-lined tray. Cover with plastic wrap and let rise in a warm spot for 20-30 minutes. Fill a large pan with three inches of walnut (or other neutral) oil, and heat until 365 degrees F. Drop in a few doughnuts at a time, frying until golden brown on both sides. Remove with a slotted spoon, and place on a paper-towel-lined plate Heat oil back to 365 degrees before frying remaining batches. Fit a pastry bag (or large ziploc bag) with a round tip, and fill bag with pastry cream. Use tip to make holes in each doughnut, and fill with the pastry cream. Alternately, cut a hole in the doughnuts with a serrated knife, and spoon in pastry cream using a small spoon. Dust doughnuts with powdered sugar (and a little ground cardamom, if you really love the flavor) while still warm, and serve immediately.